All transactions are safe and secure with a reliable history in online purchasing behind each of our associates. Buy the District 12 Mining t-shirt to own Hunger Games clothing and merchandise. Available in both men's and women's styles, this Hunger Games District 12 t-shirt represents Katniss Everdeen's home region. Its primary function is mining coal for the Capitol, making it the poorest of all the districts. Located in the Appalachian Mountains, it is comprised of four distinct areas: The Seam, the Hob, the merchant sector and the Victors' Village. The entirety of the region is surrounded by a twenty-foot tall electric fence, likely constructed to keep the people in. 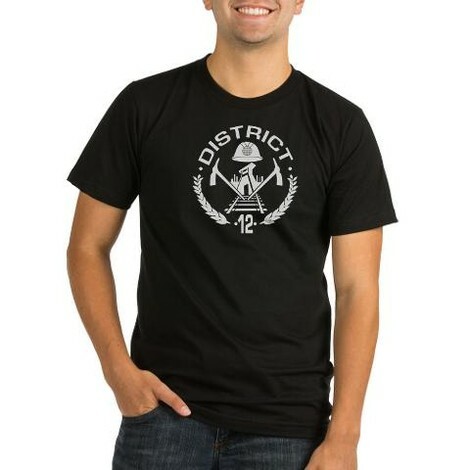 In addition to the District 12 Mining tee above, browse the Hunger Games Clothing Gallery for more apparel like men's and women's clothes, kids shirts or hoodies.